The story of John William Jones is unusual. Despite having two distinctly separate periods of service in the war (having been discharged as medically unfit twice) and surviving until at least 1919 he was none the less remembered on the Hope and Caergwrle memorials. His brother was likewise discharged as unfit but not remembered on the memorials. John was one of 4 children (and 2 step children) of Harriet Louisa Jones (nee Lewis) and Joseph Parry Jones. Harriet was born in Hope in 1872. In 1891 she was living with her parents in the High Street, Hope and was working as a laundress. In 1892, at the age of 21 Harriet married a 35 year old widower, Joseph Parry Jones, who had two small boys aged 9 and 4. The eldest step-son (also Joseph Parry Jones) died aged 20 of consumption in 1904. Harriet’s husband died of the same condition in May 1909, and was buried on 12th May in Hope. Harriet had gone on to have four children of her own – Thomas Harold (1895 – 1957), John William (1897 – ), Minnie (1900 – 1940) and George Cecil (1902 – 1930). John was born in Caergwrle in 1897, probably in April or May, given that he was exactly 17 years old when he first joined the army on 6th May 1914. Records of John’s schooling have not been found but he probably started at Abermorddu School as Hope School did not open until 1906. The census returns tell us that 1901 the family lived at Alyn Bank (probably next to the Primitive Methodist Chapel), and in 1911 at Bryn Alyn (possibly the same house or street). However his sister Minnie’s school admission record shows that the family lived in Castle Street in 1908. By 1914 he was living with his family at 3 High Street, Caergwrle. 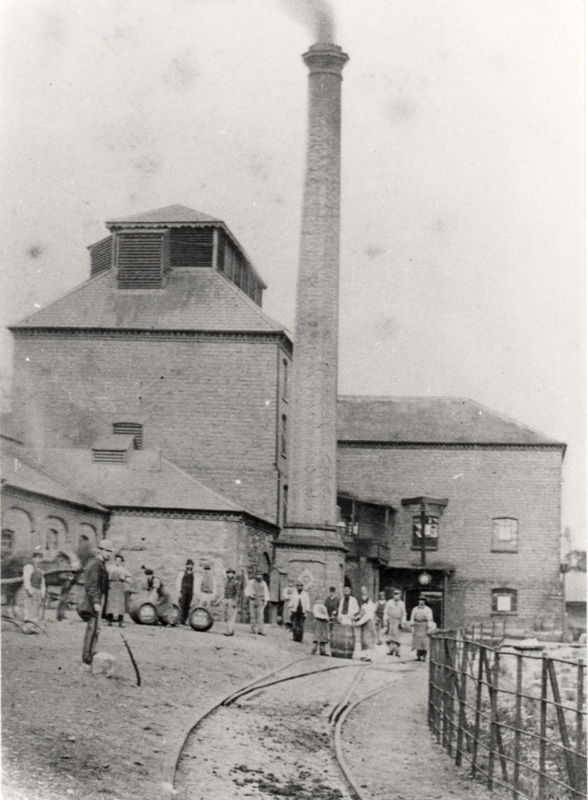 According to John’s attestation papers when he enlisted in 1914 he worked as a labourer at the Lassell Sharman Brewery (Caergwrle Brewery) in Caergwrle. The brewery was founded at Milton St. Liverpool by 1832, established at Caergwrle in 1861 (largely because of the quality of the water of the River Alyn), acquired by Burtonwood Brewery in 1945 with 57 pubs, and then closed down. On joining the Territorial Force a few months before the war John was described as 5’ 2” tall, with good vision and good physical development. He was therefore appointed to the 5th Battalion of the RWF as Private 1500. On 5th August 1914 (the day after war was declared) he was embodied, which meant that he was called up for full time service with the regiment. 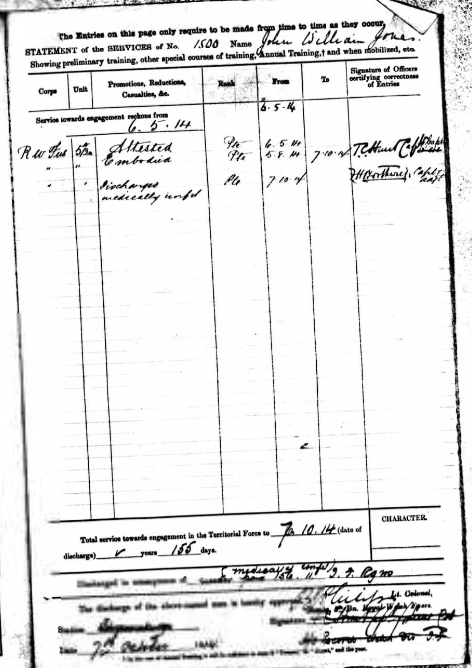 The records do not state where he was stationed, but two months later, on 7th October 1914 he was discharged from the army as medically unfit. This second period of service had lasted one year and 101 days. He was granted a pension of £15 per week. On discharge John was described as 5′ 8″ in height (he had grown 6” in two years) with a fresh complexion, grey eyes and dark brown hair. His character was described as sober, steady and trustworthy. He had been trained in first aid and ambulance duties. His occupation on discharge was described as surveyor’s labourer, and he returned to live with his mother at 3 High St, Caergwrle. In May 1917 he was awarded the Silver War Badge – awarded to men who were discharged as physically unfit for war service. 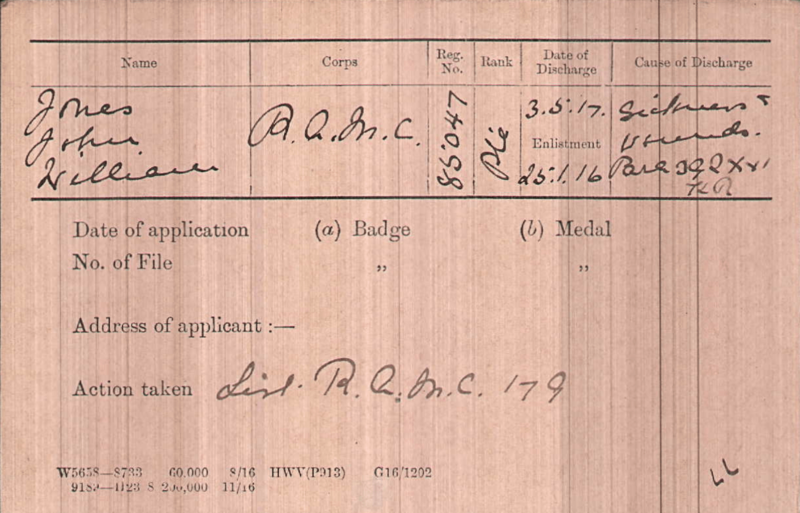 Although the medal card states that he was discharged because of “sickness and wounds” the register of silver medals states that he was discharged because of sickness. 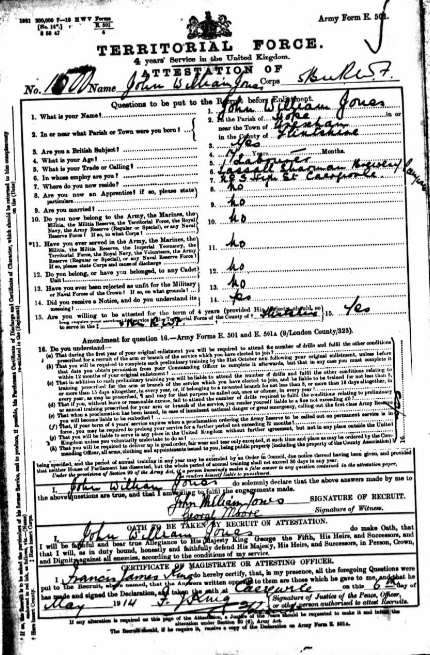 No date has been found for John’s death but it must have been after 1919. He was a witness at the wedding of his brother Thomas’s wedding to Amy Spencer on 27th September 1918. His record card in Flintshire Record office, signed 11th September by Richard Ollerhead, makes it clear that John was neither deceased nor missing. It remains a mystery as to why, having survived the war, he was commemorated on the Caergwrle and Hope War Memorials, and it can only be assumed that he died between September 1919 and the erection of the memorial in the early 1920s. Given his medical condition that has to be a possibility. John is also commemorated on the Caergwrle memorial. His family history can be viewed at http://person.ancestry.co.uk/tree/70118846/person/42223124232/facts. What happened to John’s family? His eldest stepbrother, Joseph Parry Jones died of consumption (tuberculosis) in 1904 aged 21. Their father, also Joseph Parry Jones, a brewers man, died in 1909, also of tuberculosis. John’s other stepbrother, James Clifford Jones, was born in 1888, two years before his mother Sarah died. His father married Elizabeth A Jones in 1909, and their son William A Jones was born in 1910. 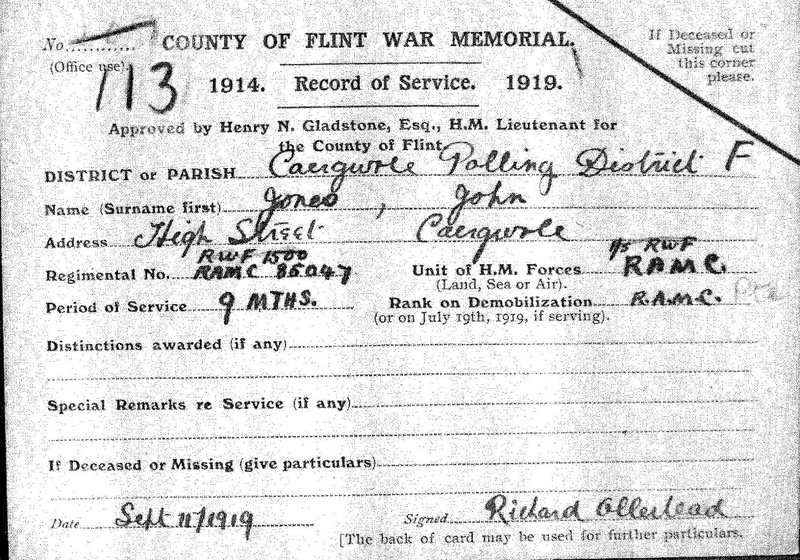 No military records have been found for James, and it may have been that he was exempt from service as he was a miner. On 12th July 1918 he was working as a holer for the Westminster and Brymbo Coal and Coke Co Ltd at Gwersyllt Colliery when he sustained a fractured skull in a fall of coal. The 1911 census, 1939 Register, and his burial record (1981) all state that he lived in Bryn Issa, Brynteg, though not in the same house. John’s brother Thomas Harold Jones, known as Harold, attested 5th February 1916 (a few week after John) at Caergwrle, and joined the Army Reserve. He was mobilised to join the Service Corps (MT) at Grove Park on 27th October 1917. Grove Park Hospital in south east London, had originally been a workhouse. 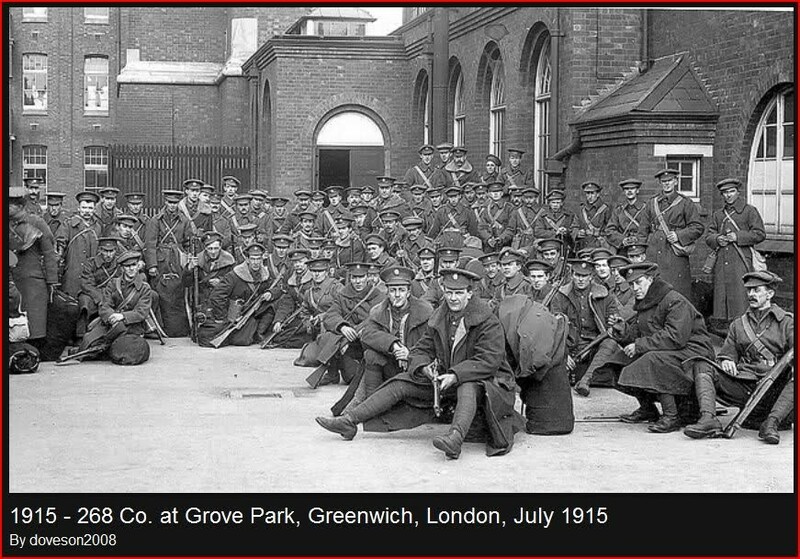 At the beginning of WW1 in 1914 the workhouse was requisitioned by the Army Service Corps. Its occupants were relocated and the buildings were used as a mobilisation training camp. Harold was discharged from the army on 3rd April 1918 at Lark Hill, Salisbury Plan, as being no longer physically fit for war service. He was declared unfit by reason of his bronchitis from which he had suffered since childhood. He stated that his father and brother had died from consumption. Harold’s civilian occupation was “Ford and steam wagon driver”. His discharge address was 30 High Street, Caergwrle. Harold was awarded the Silver War Badge in 1920. 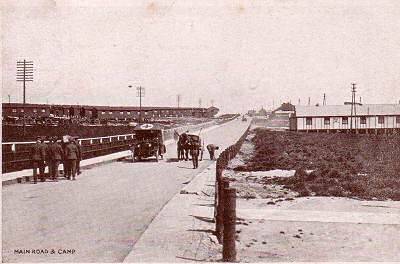 From about 1890 Larkhill Camp started to be developed as a Garrison to support the training activities on the Plain. During WW1 many thousands of troops were billeted on the plain, some under canvas, others in wooden huts. Initially three tented camps were built at Durrington, Larkhill and Fargo with a light railway system serving all three. John’s Mother Harriet was born in 1871, After the war she lived at 3 High Street Caergwrle, and continued to work as a laundress until at least 1939 when the government compiled a register of everybody in England and Wales. She died in April 1940 and was buried in Hope on 15th April. Minnie was born on 13th February 1900, a date confirmed by the school admission register. When she entered Hope National School on 24th August 1908, the family lived in Castle Street, Caergwrle. She left the school on 30th March 1914, having reached the upper age limit for school. By 1939 she was living with her mother at 3 High Street, Caergwrle, and was working as a Brewery Union Room Attendant. She died, unmarried, in December in Wrexham, aged 91. George Cecil Jones was the youngest child of Harriet. He was born in Caergwrle on the 14th March 1902, and baptised in Hope parish church on 16th April 1902. He started school at Hope National School on 30th August 1909. The family was recorded in the admissions register as living in Brewery Cottage. He left school on 6th March 1916, having reached the upper age limit for the school. No further details have been verified.